Work begins at State Street at Choctaw Road. A map of the area, including detour routes. Hemphill Consturction crews mill State Street near Choctaw Road. 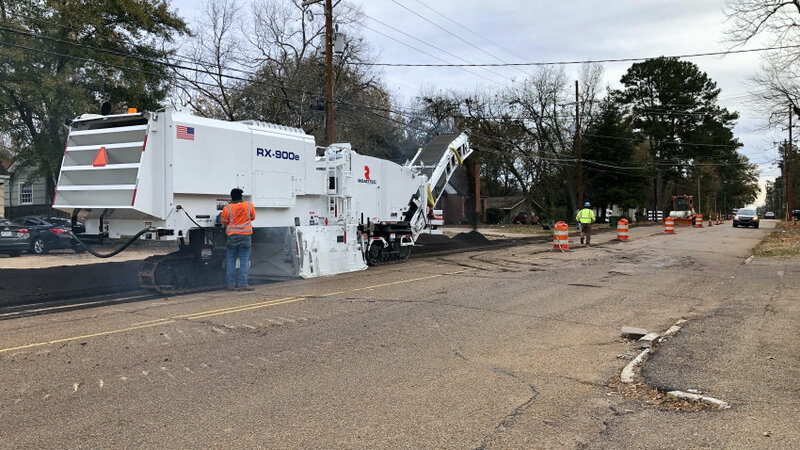 The City of Jackson says the next phase of State Street reconstruction, announced through the TIGER Grant project in 2015, will begin Monday in Fondren, weather permitting, making State Street a one-way road for a time. Starting December 10, lane reductions and detours will be set up between Hartfield Street and Choctaw Road. This means that State Street northbound from Hartfield Street to Choctaw Road will be reduced to one lane, northbound only. All southbound traffic will be detoured starting at Meadowbrook Road to West Street to Mitchell Avenue. Local access into the neighborhood can use Northview Drive to access residences. 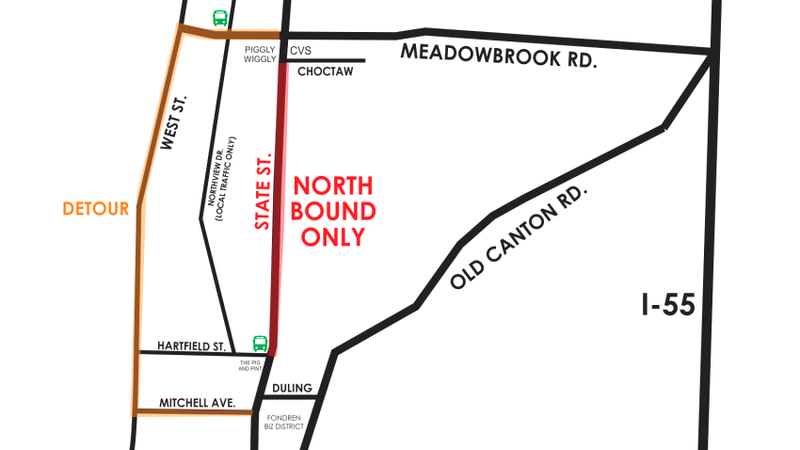 State Street southbound from Meadowbrook Road to Piggly Wiggly grocery store and the CVS, will be left open to maintain business access. This segment of work is expected to last into summer 2019. This next phase will completely reconstruct State Street from Hartfield Street to Choctaw Road. 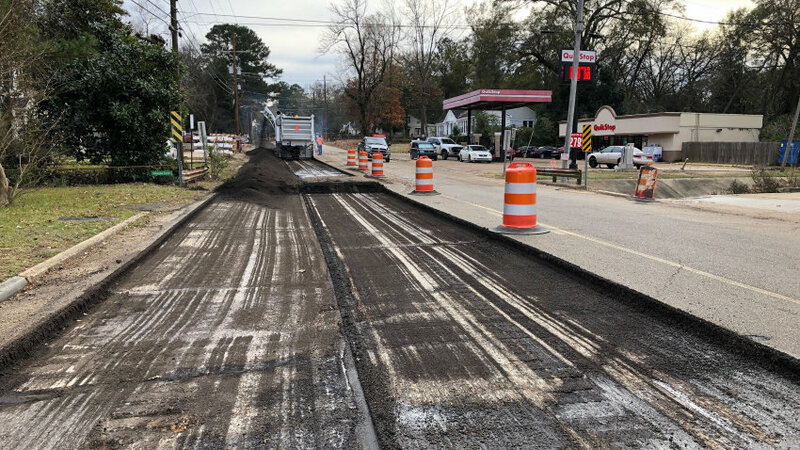 The State Street Reconstruction Project is funded by a TIGER grant from the U.S. Department of Transportation with the Federal Highway Administration and Mississippi Department of Transportation providing grant oversight. This project is also funded by the 1% Municipal Special Sales Tax and other city funds. When finished, State Street will have all new pavement, water lines, sewer lines, curb/gutter, drainage lines, transit shelters, sidewalks and traffic signals. A JATRAN route 1 detour – that follows the same detour as other traffic – will put two temporary bus stops at Meadowbrook Road/Northview Drive and West Street/Hartfield Street. Update: On Wednesday, December 12, the lane shift began and State Street between Hartfield Street and Choctaw Road became northbound only as the first part of phase two began.